A team of engineers at the international design consultancy, Frog Design, has assisted in creating a product to help diabetics examine their feet. Diabetes is a chronic disease that can cause damage to the organs and the nerves, especially the peripheral nerves that extend into the hands and feet. For that reason, it is important for individuals with diabetes to check the bottoms of their feet on a regular basis. However, the practise does pose two significant problems. First, the majority of diabetics are elderly or obese and may not have enough flexibility to do so. Second, one of the first signs of trouble is the loss of sensation in the feet, in effect robbing diabetics of their natural warning system. This lack of sensation can lead to untreated inflammation and deep cracks that can lead to ulcers, lesions and, potentially, amputation. A team of engineers at Frog Design has created a product to help out. By combining an illuminated and magnified mirror system with a weight scale, the Insight Foot Care Scale displays the patients’ weight on a large LED readout, reminds them to check their feet, and then shows them a bright and magnified image of the soles of their feet. It has been designed specifically to help patients spot the first signs of foot irregularities and help to stop the rapid rise in amputations. 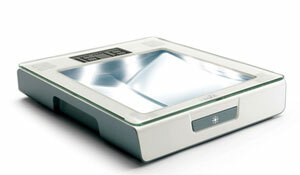 For its part in the design of the Insight Foot Care Scale, the Frog Design team received a Bronze Award at the International Design Excellence Awards 2009.